After 33 years in the Air Force, Mahaney still maintains his flying qualifications, most recently for the C-40C jet shown here. The plane is used for operational support missions and to transport members of the U.S. Congress and the Cabinet. Photo by Christopher Parr, U.S. Air Force. After graduating in 1985 from Missouri S&T’s ROTC program with a bachelor of arts degree in history, Mahaney began his military career as an electronic warfare navigator in the Air Force. Today Mahaney, a two-star general who is originally from St. James, Missouri, is chief of staff for Air Mobility Command (AMC) headquartered at Scott Air Force Base in St. Clair County, Illinois. The 107,000 men and women of AMC in active duty, Air National Guard, Air Force Reserve and civilian service provide airlift, aerial refueling, air mobility support, and aeromedical evacuation across the globe. Mahaney says he leads by optimizing the AMC staff, prioritizing mission demands and enabling the AMC commander to make decisions at the speed of war to provide rapid, global mobility and sustainment for America’s armed forces and humanitarian support at home and around the world. Mahaney speaks with compelling optimism about the sense of purpose he’s lived by during his military career. Mahaney’s been deployed numerous times, most often and most recently to the Middle East, combating the war on terrorism by directing airlift, air refueling, forward logistical operations, and air drops of equipment and supplies while working with a coalition of U.S. Army, Navy and allied partners to deter and defeat enemy threats. In his multifaceted, 33-year military career, Mahaney recalls two major turning points. While in service, Mahaney burned the midnight oil to earn a master’s degree in public administration in 1988 and a law degree in 2000. Mahaney updates Congress and the American people about Air Force operations. 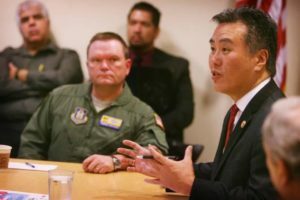 He’s shown here with U.S. Rep. Mark Takano of the 41st District of California and a group of civic leaders from the state. Photo by Mark Muckenfuss, Press-Enterprise, Riverside, CA. He says a second career turning point occurred in 2004 when he was selected for a Capitol Hill Fellowship at Georgetown University and worked as a legislative military liaison with Congress at the Pentagon. Mahaney says that he believes this opportunity helped broaden his perspective and positioned him to apply another vantage point to challenges faced as an Air Force senior leader. He later received a National Security Fellowship at Harvard, where he contributed to roundtable discussions about the economics of national defense and subsequently attended the NATO School in Oberammergau, Germany. From 2013 to 2016, Mahaney served as Commander of the Air Reserve Personnel Center, which provides personnel support to nearly 1.3 million Air National Guard, Air Force Reserve and regular Air Force and retired members. Mahaney says that this broadening assignment provided him with a breadth of experience outside of operations that helped him understand the complexities involved in providing airmen with everything needed to do their jobs to the fullest. He then moved into the role of deputy director of operations for Air Mobility Command. With a mobility enterprise comprised of 107,000 active duty, Guard, and Reserve airmen and civilians across 14 U.S. locations and dozens overseas, Mahaney was responsible for the rapid global air mobility that allows America to deploy military forces anywhere in the world within hours. In 2018, Mahaney was promoted into his current role as chief of staff for AMC where his operations and personnel experience come together. From his beginnings as a pilot, Mahaney had the opportunity to stair-step up and lead in groups that systematically grew larger, from squadron, to wing, to major commands. Mahaney says he builds relationships with Airmen by working on their teams. 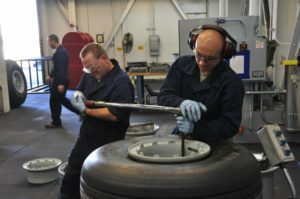 Here he helps prepare an aircraft nose wheel for operation. Photo by Mark Muckenfuss, Press-Enterprise, Riverside, CA. 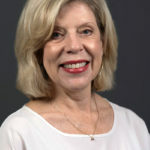 Mahaney leads with four tenets: Take care of people, and they will take care of the mission; create a culture of respect; expect excellence; encourage feedback. And after all this is done, Mahaney says he’s just happy to still be flying. Awesome Inspirational article! Well spoken and well written, thank you both for sharing!